PHI’s synchronized bending machines, Models 210, 220 and 233, offers three-axis bending with one powered axis for the degree of bend (DOB). 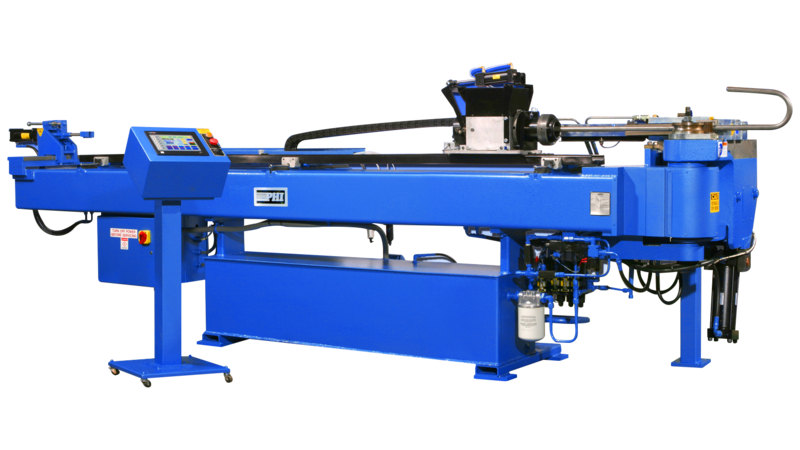 When configured as shown, these 200 series benders provides high-speed production of simple and complex bent tube shapes up to 3” outside diameter (OD) and pipes up to 2” IPS. Configurations range from a slim head and bed profile with spacious underbed clearance to minimize bending interference, a dropaway clamp (Models 220 & 233 only) which speeds production of complex parts by dropping the clamp away from the bend head prior to retracting the clamp and positioning it for the next bend. 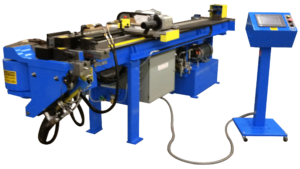 This eliminates the problem of pipe getting in the way of the clamp and bend die in its retraction cycle. Our modular design – a basic machine with many options – allows each machine to be custom fitted to best meet your needs. PHI’s user-friendly programmable digital controller, is specifically designed for bending and is logically laid out for proper bending sequencing. It has a capacity for 100 programs consisting of 1 to 10 bends (DOB’s) per program. The optional carriage allows mechanical presetting of up to 10 planes of bend (POB) and distance between bends (DBB). 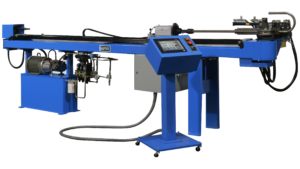 When incorporated with the controller, the machine will synchronize and interlock all three positions (POB, DOB and DBB) to ensure correct tube alignment before bending can occur. 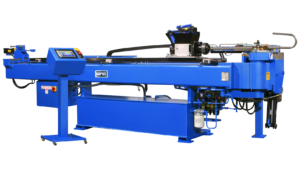 This ensures easily repeatable bent tube shapes and scrap free production. Quality Output: Perfect part duplication, scrap-free production, quality tooling, positive POB stops and DBB stops. Labor Savings: Single setup for multiple bend parts. Reliable Performance: Heavy-duty construction and extra-large electric motors. Performance-Enhancing Features: Precision PHI tooling to help reduce wall thinning and ovality. Synchronized interlock positioning for accurate, scrap-free parts.